UPDATED: See the full command line at the end. A little background; during development, we use a vagrant based deployment of Kubernetes running in a two node cluster. We need two nodes to test VM migrations. This has been the biggest reason we have not yet moved to minikube. The various piece of kubevirt run in the vagrant cluster inside containers. 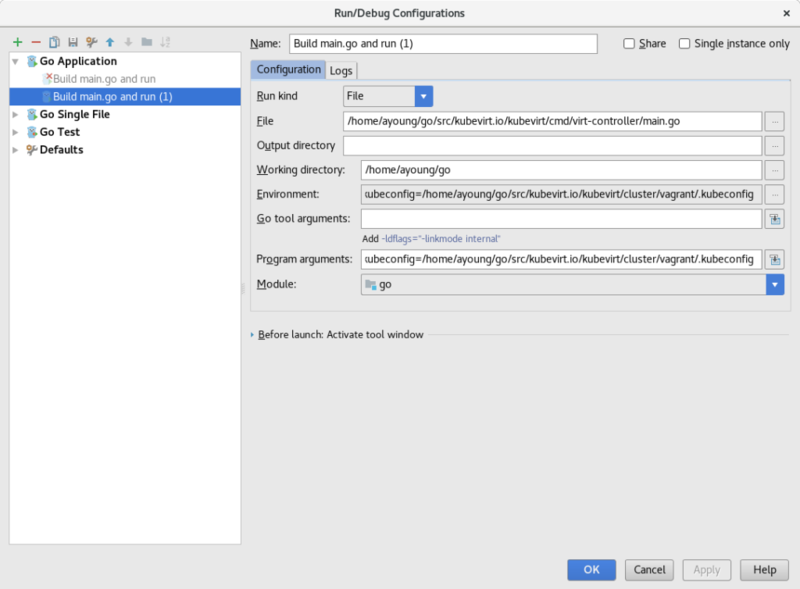 However, the design of Kubernetes (which kubevirt follows) allows a controller to run from pretty much anywhere that it has access to the API server. In this case, I want to run it from within my git repo on my laptop. 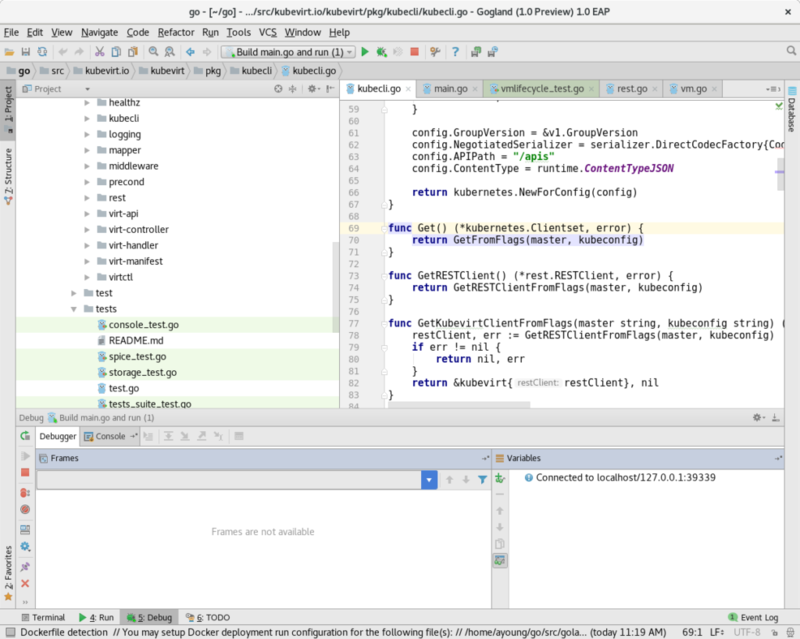 I actually run it from gogland, as I like the interactive debugger, but that is not a requirement. Once that is up and running (successfully), delete the virt-controller deployment. One hack: I had to change the name of the file from cmd/virt-controller/virt-controller.go to cmd/virt-controller/main.go or I could not debug it. Seems to be a bug in gogland. Once I changed the file name, running it will report an error. To run any of the kubernetes aware pieces you have to pass in a proper configuration environment. In the case of virt-controller, that is done by setting the parameters on the command line by adding the flag. Add the above line to Program Arguments. level=info timestamp=2017-06-24T02:10:35.858175Z pos=vm.go:73 component=virt-controller service=http msg="Starting controller." level=info timestamp=2017-06-24T02:10:35.858272Z pos=migration.go:70 component=virt-controller service=http msg="Starting controller." level=info timestamp=2017-06-24T02:10:35.858154Z pos=main.go:89 component=virt-controller service=http action=listening interface=0.0.0.0 port=8182 level=info timestamp=2017-06-24T02:10:35.858175Z pos=vm.go:73 component=virt-controller service=http msg="Starting controller." level=info timestamp=2017-06-24T02:10:35.858272Z pos=migration.go:70 component=virt-controller service=http msg="Starting controller." level=info timestamp=2017-06-24T02:13:03.129093Z pos=vm.go:73 component=virt-controller service=http msg="Starting controller." level=info timestamp=2017-06-24T02:13:03.129170Z pos=migration.go:70 component=virt-controller service=http msg="Starting controller." $ bin/virt-controller --kubeconfig=/home/ayoung/go/src/kubevirt.io/kubevirt/cluster/vagrant/.kubeconfig --launcher-image kubevirt/virt-launcher:devel --migrator-image kubevirt/virt-handler:devel --port 8182 level=info timestamp=2017-06-24T02:13:03.129090Z pos=virt-controller.go:89 component=virt-controller service=http action=listening interface=0.0.0.0 port=8182 level=info timestamp=2017-06-24T02:13:03.129093Z pos=vm.go:73 component=virt-controller service=http msg="Starting controller." level=info timestamp=2017-06-24T02:13:03.129170Z pos=migration.go:70 component=virt-controller service=http msg="Starting controller."